I just wanted to tell you how very much we appreciate this wonderful doggie!! He is just a big INTELLIGENT, AFFECTIONATE baby! We still have some minor things that need work but overall, what a terrific doggie. Patrick and MIKEY rough house with him. (Otis always wins). We all throw balls or toys for him to retrieve and he runs his heart out. MIKEY brought his cat who is nonplussed with Otis and Hector still hisses and smacks Otis daily:-) Otis is fascinated with the cats!! Cannot figure that one out! Here is the most recent scenario regarding Otis and Mikey’s cat. Otis and I walked into house. Otis went right for Mikey’s cat on couch. Otis stared and cat did not move. Otis just put his paw on cat and started licking his head!!!! Cat simply laid there like rubber kitty!! Is he entertaining or what?!? Everyone takes him out for walks. He loves running the filbert orchard and he likes playing with Shorty (the Beagle). At night (when we are out for the orchard walk) I cannot see him but he stays close to me in the dark so off with the leash. 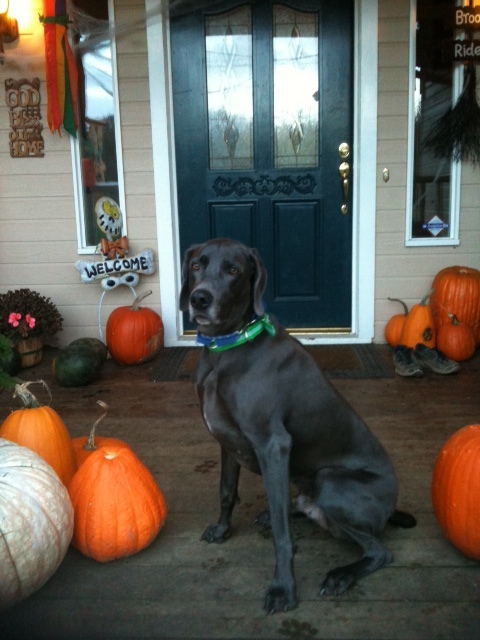 Otis only has this amazing freedom because we sit in an orchard and back up to farmland and trees with fencing. Otis and the Crate, etc. He likes his crate and it is a good place for him out of the traffic pattern. Funny thing is: when he wants out , he makes a noise so out we go. I figure we must spend several hours a day out exploring. He hasn’t caught one yet but he really enjoys chasing squirrels. Sure helps keeping them away from the chickens and free food. 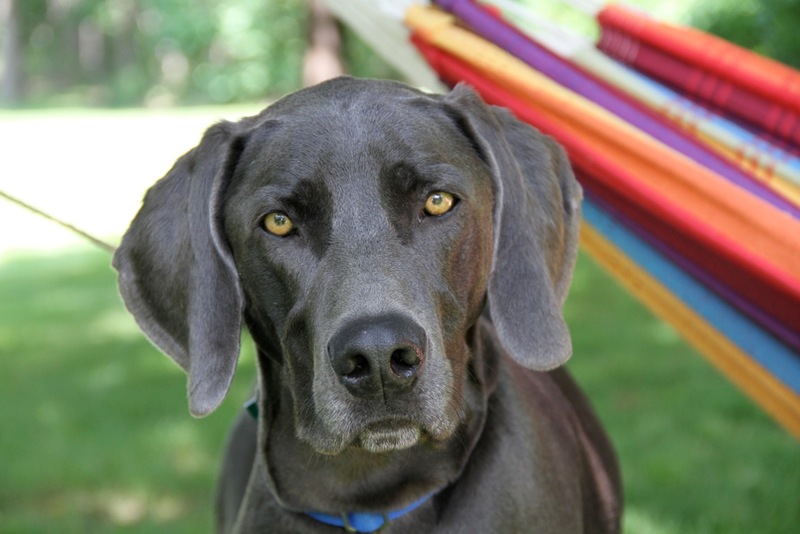 Posted on November 18, 2013, in Cats and your Weim, Previous Pup Update, The Weimaraner, Torrie X Zee and tagged Blue in Oregon, Blue Male Weimaraner, Breeder's Obligation, Good news from Oregon, Otis, Protecting the Weimaraner, rehomed Weimaraner. Bookmark the permalink. 4 Comments. For Jorja because we walk at 5:45 each work morning I bought a reflector belt the military members use for PT and had a friend sew a piece across her lower back of her 2 hoodies and winter coat- it had reflectors trimming but with the dark here we added more and then with the left over she made a collar that velcos around her neck so I can see her much better when she’s up in the trees. Not perfect, but it helps when the occasional car comes past on her off leash areas.